Cricketers these days do not hold back and wear their heart on sleeves. Especially in T20 leagues like Indian Premier League (IPL) players fight it hard. 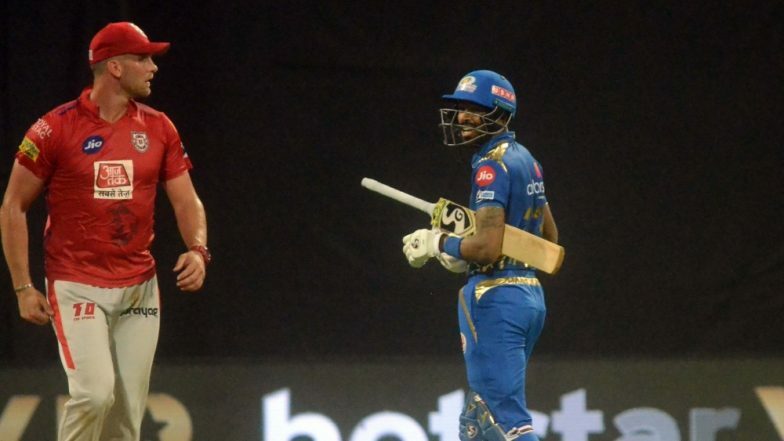 During the nail-biting clash between Mumbai Indians (MI) and Kings XI Punjab (KXIP), Hardik Pandya and Hardus Viljoen stared each other down mid-pitch. At the end of Mumbai Indians 12th over, South Africa Viljoen walked straight towards Pandya and the duo starred at each other. MI vs KXIP, Stat Highlights: Kieron Pollard’s Magnificent 83 From 31 Balls Helps Mumbai Indians Beat Kings XI Punjab by Three Wickets. Viljoen eventually backed off and gave a cheeky smile. Three overs later, in the 16th over, Pandya lost his wicket as Mohammed Shami had him caught in the deep. The all-rounder was Mumbai’s fifth wicket to fell with the score reading 135. Pandya lasted only 13 balls and scored 19 runs. He smashed two fours during his short stay at the crease. It was stand-in skipper Kieron Pollard who helped Mumbai chase down 198. The bulky right-handed batsman scored 83 off just 31 balls. Pollard during his match-winning knock smashed three fours and ten sixes. Chris Gayle’s Injury During MI vs KXIP IPL 2019 Match Leaves Ravichandran Ashwin Worried. Coming back to Pandya, he had an ordinary day in the field. With the ball, the all-rounder was taken to cleaners and he ended up giving up 57 runs from four over. Though he picked a couple of wickets as well. Viljoen, on the other hand, gave away 34 runs from his quota of four overs and went wicketless. Mumbai Indians Captain Rohit Sharma Shares Cute Picture of His Pet Dog on National Pet Day 2019. Mumbai Indians will now face Rajasthan Royals next while Kings XI Punjab will take on Royal Challengers Bangalore. While Pandya has cemented his place in the MI team, it will be interesting to see whether Viljoen gets another game or not.